You had a chance to review the first set of enhancements in my Part 1 article. Now we will review a second set of features to conclude the Microsoft Dynamics GP 2010 Service Call Management enhancements series. You can automatically generate vouchers in Payables Management for subcontractor labor, expenses, or additional charges. The vouchers are created during service call billing. 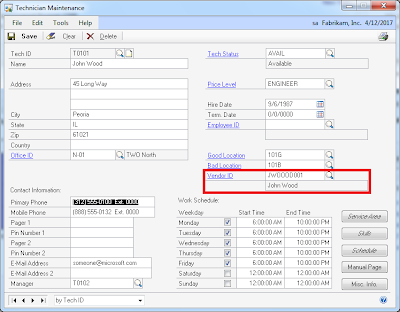 To enable this feature, you must specify a Vendor ID for each subcontractor technician. 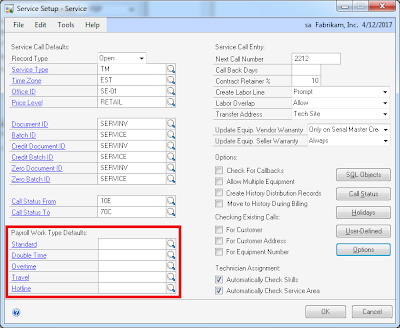 You also can designate subcontractor service types. You can now post labor information from Field Service to U.S. Payroll. New setup options, Payroll Integration and Post to Payroll, are added to the Service Setup window. When these options are activated, Field Service integrates to U.S. Payroll for labor or indirect labor. Payroll transactions can be based on the information that is entered in the Service Call Entry – Labor, Labor Information, and Indirect Labor Entry/Update windows, and in a new window, Field Service Labor – Payroll. This feature also integrates the cost from the employee's pay code to the labor record in Field Service. You can add kit items to parts lines, and you can make changes to the component lines, including quantity ordered. 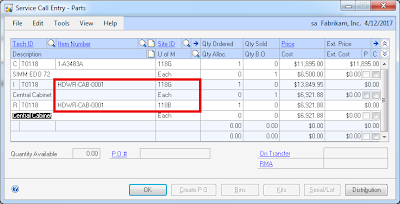 You can create a purchase order from a kit item or from one or more component items. If you do so, the kit item cannot be transferred, but the individual inventory components can. You can specify a kit as a part for an engineered change order. The resulting service calls that are generated include the kit item and the components that are specified in a new window, Service Parts – Kit Components. One thing I found interesting when entering a kit on the Service Call Entry - Parts window is, when a kit is selected you have one and only one chance at entering the quantity being ordered before the code breaks down the kit into its components on the Parts window. I also think that a validation is missing where users are warned when a component belonging to a kit is removed from the Service Call Entry - Parts window. You can now create a standard workflow to manage the approval process for service call escalation steps. 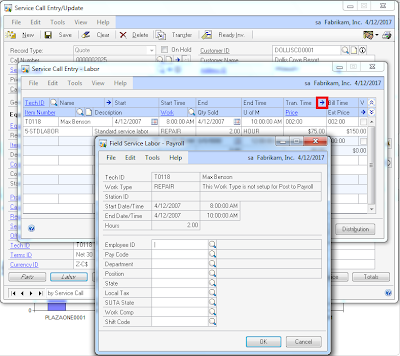 A new workflow type, Escalation Override, applies to service call documents in the Service Call Entry/Update window. 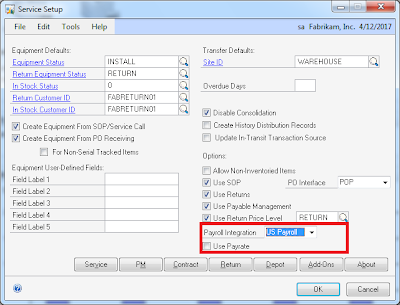 You can activate the workflow by using the Service Type – Escalation window. Hope you enjoyed this 2-part series and have had a chance to explore some of the new Service Call Management enhancements. Huge, huge are the integrations to payroll and the ability to post payables vouchers for subcontractors. This certainly reduce the amount of steps users have to engage in when closing a service call. I won't be surprised you will see more integration with Manufacturing in a future revision of this module. Great stuff man! Thanks for pointing out these valuable improvements!